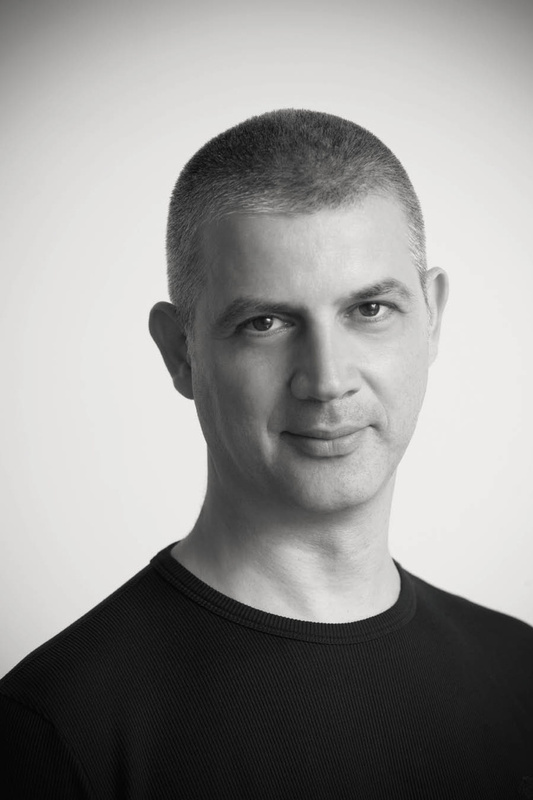 Gideon Amichay, who was profiled in this magazine five years ago during his eighteenyear tenure at Tel Aviv agency Shalmor Avnon Amichay Y&R, almost singlehandedly put advertising from Israel on the creative map. After leaving the Y&R affiliate, he founded his own creative shop called “No, No, No, No, No, Yes,” which is based in New York City as well as in Tel Aviv. In the interview that follows, Michael Weinzettl chats to the cosmopolitan top creative who kindly consented to put together a selection of digital work he admires for this very issue of Archive. What were some of the criteria you applied when putting together your picks? I think most of my picks have used old-world “website chic” and integrated it into the new clean and minimal design phase we are in. Just take a quick look back at the past 10 years in the digital arena – all the websites that used to work on flash are gone now. All of them have been replaced by much “cleaner” websites and platforms that are flat and minimal – less text, less colors, and simple UX. That is currently the default style, and everyone wants the same (i.e. Apple). I chose ones that had a touch of the old beautiful integrated into the new. Probably because, while I like simplicity a lot, I love to be surprised (and I’m not that easily surprised). You can probably identify a pattern in my picks – a kind of minimalism, with a magic touch. Hermann Vaske did an in-depth interview with you five years ago for Vol. 1/2011 of this magazine. What has happened in the time since then? For you personally and your agency, No, No, No, No, No, Yes. It’s only been five years? Wow, so much has been happening ... Back then, I was still a partner at Shalmor Avnon Amichay Y&R, leading a great creative agency. I was there for 18 years, on a quest to make the Israel advertising scene famous on a global scale all the way to the Cannes Festival – and I can happily say we succeeded. Since then, we (the partners) sold our shares, and I left Shalmor Avnon Amichay Y&R and started looking for new challenges. My first book was published in Israel. It’s about my personal and professional journey (“No, No, No, No, No, Yes – Insights From a Creative Journey”). I gave a TEDx talk, moved to NY, translated my book (now published in the US) into English, started to teach at SVA, met a lot of new people, experienced a lot of new experiences, and in 2013 opened “No, No, No, No, No, Yes,” a creative boutique focused on “Ideas That Make News.” We work on innovation in communication and advertising. Two years later, we opened our second office in Tel Aviv. As you can assume, it has been five challenging, busy and fun years. I stepped away from my comfort zone, which wasn’t easy, but I’m filled with satisfaction and I’m very proud of our team. Overall, we are 10 people. I have known and worked closely with most of them for more than 10 years. I can full-heartedly say we manage to do something new and different every day. It’s a creative agency – not an advertising firm. It’s not because we don’t like to create advertising. On the contrary. But we do believe that advertising is only one way to solve a marketing/business challenge. We would like to work in a wider space. Are you based in New York now or Tel Aviv, or do you go back and forth? I don’t think about it so much as back and forth. I have two homes now, one in TLV and one in Manhattan, and in a strange way I live in both simultaneously. If you can’t find me here or there, I’m probably in between, trying to sleep on the airplane. I’ve got used to living with a constant case of jetlag and a small packed suitcase, yet I couldn’t be happier. I built a great team and we choose our clients carefully. What’s left now is focusing on doing our best work for them. How has the ad business changed in those five years since we heard from you? Have some of the parameters changed? Have some media taken the lead over others? The fundamentals have not changed. Storytelling is more important than ever. Advertising is changing just like the entertainment industry is. Think about movies, music, and gaming. New platforms, new business models, VR … You can really create anything you care to come up with. Same goes for advertising. There is so much content out there, but most of it isn’t good enough. Actually, that was a compliment. Most of it is horrible. We are seeking more and more great content (which is out there, but isn’t easy to find). We have more and more platforms, and we have less time. But at least we can use the media in such a creative and convenient way. I believe the real fight these days is not between the platforms out there, or the ridiculous battle between digital and TV, but between good content and bad content. As a matter of fact, it’s between content that we’d like to read/watch/share and content we don’t care about in the little precious time we have. That’s the real competition. It’s funny to look at the rise of adblockers ... No adblocker can stop a good story. In a way, the adblocker phenomenon is very good for our industry. The NEW consumer – as they love to call it in the media – lives in the digital world armed with all available technology and will always love to enjoy a good story. Technology gives more and more great opportunities for storytelling. It’s hard to think of anything that is off limits for good stories and ideas. Another change is the need to stand out. And standing out requires ideas and better storytelling. Once you have a big idea, it’s great to consider all these new storytelling opportunities, each able to tell a different part of the story, all working together. The craft of storytelling has been upgraded incredibly. A few months ago (June of this year), we were asked to promote the 2016 International Cyber Week at Tel Aviv University. We built a giant piece of artwork in the shape of a horse. It was created with thousands of infected computer and cell phone components to illustrate the increasing use of malware, making cyberspace a hostile environment. Like in the legendary story of Troy, the Cyber Horse stood at the front gates of the conference auditorium and was waiting for the doors to open. A week before the conference, we also opened a Twitter account for the Cyber Horse. It followed all the conference guests, speakers and reporters. We thought that the best way to promote the conference should be an art installation, rather than advertising. The right storytelling will break the boundaries of the cyber community. What is some of the digital work that you have been involved in over the course of your career, work you look back on with special fondness, pride or, perhaps, even despair? Way before crowdsourcing and user-generated content became old news, we were doing campaigns that fully involved people, like having your face printed on your favorite yogurt treat in stores (Danone, 2008), or creating interactive art experiences in partnership with the well-known modern Israeli artist Piven (Strauss, 2009). Back then, it was fresh and unique to get people to engage with your brand experience. Today, crowdsourcing is almost basic – everyone shares, writes his own opinion, and makes his own content. Today, you have to work much harder to get your consumer to participate in your marketing move. Not long ago, we did a different kind of crowdsourcing project, celebrating the Hebrew Wikipedia’s 10th anniversary in Israel. For an entire week, the most respectable journalists in Israel wrote a new article for the Hebrew Wikipedia. The article was in their field of expertise and based on their personal knowledge. In addition, each reporter recorded a one-minute video item, explaining his/her decision to write about that specific topic and the research they did. The item was aired as part of the news portion of Channel 2, the most-viewed TV channel in Israel, and got huge exposure on all of the channel platforms. It was a more sophisticated professional crowdsourcing project. What are some recent ad campaigns from around the world that have impressed you? I was impressed with Amazon’s latest shorts promoting their AI home assistant, Alexa. They strategically chose to create short demos (10 seconds each) instead of using superlatives. They made many extremely short yet very entertaining videos. And short videos work perfectly with most social platforms today. An example for great advertising that I recently enjoyed would have to be Under Armor, a powerful, insightful campaign. It has all the great components of advertising: a strong statement, amazing storytelling and incredible craft, told through the personal story of Michael Phelps. At its best, advertising could and should be a great piece of content. Back in 2011, you told us of your by now famous – and ultimately successful – attempts to land one of your cartoons in The New Yorker; there’s even a lovely book on it which came out a couple of years ago and a TED talk on YouTube. Do you still have time to dabble in the occasional cartoon? I look at it less than drawings and more as ideas, and I always have time for ideas. When we have good ideas, we find the time to bring them to life. REAL LIFE. The Cyber Horse, for example, could easily be a drawing or a great Photoshop image. But I truly believed it was worth the extra mile of bringing it to life and creating a huge sculpture of it. I love cartoons with all my heart and I’m sure I’ll draw more in the future. Depends on where I am. In Israel, it will be mostly meetings and working together with my team along the day. Israelis live and work fast. I can land in TLV with a fairly open schedule and, one hour later, I’ll be booked until my next visit. NY is a different story. Here I know when and where I’ll be weeks ahead. Being in NY required me to wake up very early and immediately start working with the team and clients in Israel due to the time difference. Where do you get the inspiration for your work? Is it the stuff you read, watch on TV or online, people you encounter, or even work with? All of the above. It could be half of a sentence on the news, a glimpse of a window in the street, or just walking at the supermarket. Actually everything. But that’s – I guess – quite ordinary for every creative person. No matter how busy or tired I’ll be, I will always find the time to see a movie or a show at the end of the day. My brain is always hungry! Museums, galleries, Broadway plays and shows, ballet, opera, books, TV series, internet series – you name it. Having said that, I must share a secret – I love to go to Broadway and pick a ticket to a play or a show on the spot, not knowing anything about it. The idea is to choose something where I have no clue what it’s about. A surprise. You know what? In most cases, I’m stunned by a new creative approach. The same is with a museum or an exhibition of a new artist. I have subscriptions to more than 15 different magazines. I just love it. I frequently travel around the world and try to see, hear, and feel as much as possible. You can never know when something might click. I tell the same to my team. I’m a great believer in curiosity. Open-minded people are better partners for the next challenging brief. We have a WhatsApp group at the agency where everyone can share inspirational thoughts or examples. It can be an ad, a movie, a photo they took, etc. Inspiration is endless and I try not to forget that. Take the idea for “Latet” (a national charity organization), for example, “The Unreachable Meal.” It’s a project we did just before the Jewish New Year. There’re 200,000 families in Israel that can’t afford a Jewish New Year’s festive meal. To illustrate that distressing situation, we lifted above the ground a large festive table at Israel’s prime location, Rabin Square in Tel Aviv, making it unreachable to people who pass by. We also added a “meal soundtrack” to the piece. It was just like a museum work in the middle of Tel Aviv. Standing under the table was so powerful you couldn’t remain indifferent. I’m sure the good influence of seeing so many exhibitions and museums helped us to come up with the right execution. Some agencies still prefer to go outside their own four walls for digital; others try to integrate a digital department into their agency. Each option comes with its own set of challenges, doesn’t it? What is your take on this, as someone who’s been at the helm of Israel’s largest agency and also a smaller creative shop? Don’t limit yourself and don’t decide ahead. For some projects, you will need to find an outside solution even if you have a great digital team, and for others that is not the case. Digital is all over, there are so many specialties, and in any case one person or one agency can’t have all the answers. Not now, and definitely not in the future. We love to bring partners to the table. We love to collaborate. At least once a week, I meet a person or a company that has a new product or service to offer, just to learn new capabilities. In some cases, we come up with the idea and the client, which has its own digital department (a phenomenon that is becoming increasingly common), brings the idea to life. As long as the idea and the execution are meticulous, any method will work. Having said that, I insist that each one of the agency people be a multidiscipline talent. That’s the magic of our team. What would you say are some of your guiding principles in the way you approach work for any client? What are some of the things you always wish to achieve with your work, irrespective of the specific challenges to be taken on? Work on projects that we want to work on, and for clients we want to work with. We enjoy the challenges. ENJOYMENT is a key. Michael Conrad, the Berlin School president and a great friend, once told me: “If you don’t enjoy what you’re doing any more, then you should move on.” So I found a way to keep enjoying every second of it. Our clients choose us and we choose them. If we really want to create “Ideas That Make News” (which is our agency’s mission), then we must have a great relationship with our clients and be able to speak freely with each other. At the end of the day, the most important asset on the road to great work is not a good idea, or people (though of course they are), but TRUST. Trust is the key when you’d like to go to the “never done before” zone. It’s crucial. Therefore, that’s the most important element we’re trying to build. What is next for you and your agency? Care to divulge some of your plans for the next year? I’m more comfortable writing about the past and present but never too quick to predict the future. I guess we all have to be more flexible … I recently posted a headline quoting Facebook’s prediction that the written word will go away in the next five years and will be replaced with video. To me that sounds more like Facebook’s mission than a prediction, one which I seriously doubt will ever fully come true. At least I hope not. As a boutique agency, we are not looking to grow too fast but we are growing. We have found our rhythm, we have a strong multidisciplinary team, and we are constantly working on new projects for new and existing challenges. The less we know about our next assignment (a new category or a fresh disruptor client), the better. That’s what’s currently excites me the most. Children’s drawings can – just like photos – be turned into a printed book using mobile app Lupa. 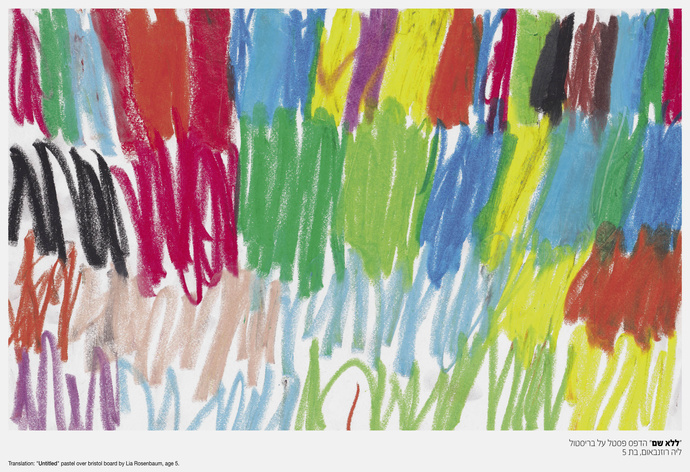 In this campaign created by Agency No, No, No, No, No, Yes, the ads – as featured in this current issue of Lürzer’s Archive – ran as a three-page campaign, with the child’s drawing shown on a spread and an image of the actual product following on the next page. 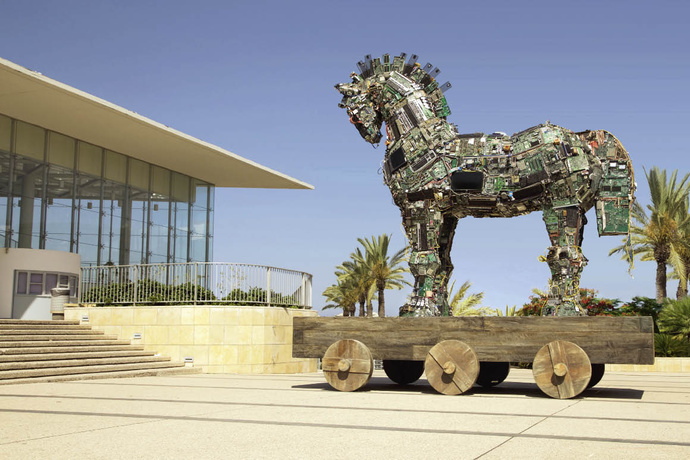 The Cyber Horse was built to mark 2016 Cyber Week, an event held at Tel Aviv University, by Gideon Amichay and his creative team at No, No, No, No, No, Yes. Assembled from all sorts of infected computer and cell phones equipment, it is a modern-day Trojan designed to focus attention on the proliferation of malware in cyberspace. In cooperation with charity organization Latet, Gideon Amichay created The Unreachable Meal. 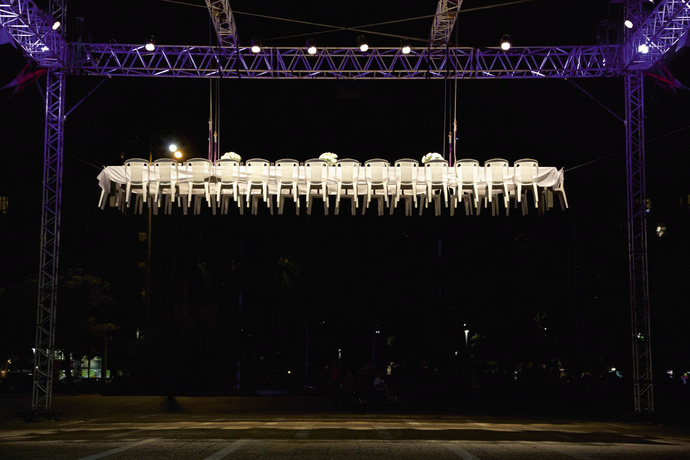 Just before the Jewish New Year, a festive table – unreachable for passersby – was lifted above the ground at the main square in Tel Aviv. The aim was to highlight the plight of 200,000 families in Israel who cannot afford a holiday dinner.